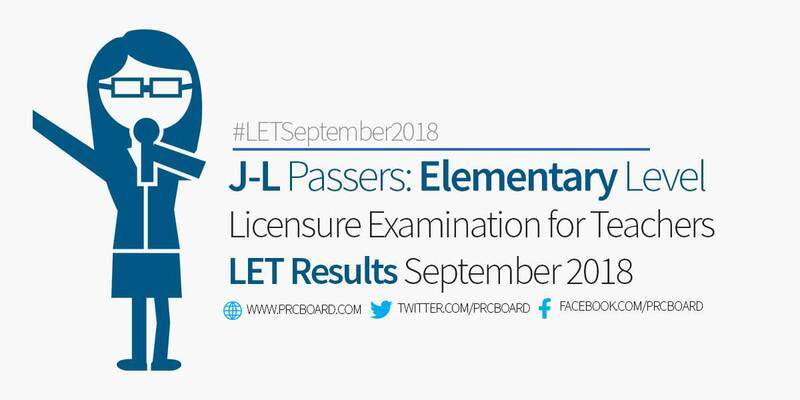 MANILA, Philippines - The official results, list of passers, top examinees, performance of schools and other important announcements for September 2018 Licensure Exam for Teachers (LET) both for elementary and secondary levels are released by the Professional Regulation Commission (PRC) 52 working days after the board exams. LET is currently the most-numbered examinees being administered by PRC. LET for elementary and secondary levels are scheduled twice a year to cater the growing number of aspiring professional teachers. For 2018, LET exams are scheduled on March 25, 2018 and September 30, 2018. Below is the list of passers for September 2018 LET (Elementary Level) with surnames starting with letters J-L. The board exams are administered by the Board of Professional Teachers headed by its Chairman, Dr. Rosita L. Navarro at PRC testing locations around the country specifically in Manila, Antique, Batanes, Bacolod, Baguio, Cagayan de Oro, Catanduanes, Catarman, Cebu, Kidapawan, Davao, General Santos, Iloilo, Laoag, Legazpi, Lucena, Masbate, Oriental Mindoro, Occidental Mindoro, Pagadian, Palawan, Romblon, Pangasinan, Tacloban, Tuguegarao and Zamboanga. To receive updates on any announcements about September 2018 LET/ Teachers board exam results, we advise our readers to bookmark this page, visit PRC official website, follow us at our social media pages via Facebook and Twitter or join the members discussions at our Facebook Group. Wat exact time lbas name nun mga passer? Been waiting .sana naman may time na ibibigay no, kasi hirap mag bukas ng phone always to check if nasa work. What is the exact time of releasing the results?